One Meal a Day for the Planet and the Center for Biological Diversity team up with supporters to act on climate and community health by changing menus across the country. LOS ANGELES (January 17, 2019) — Today, Suzy Amis Cameron’s One Meal a Day for the Planet (OMD) and the Center for Biological Diversity mobilized supporters to participate in a national call-in day to Applebee’s requesting the chain add plant-based entrée options at all locations across the U.S. as the latest push in a national campaign targeting the restaurant. In the past month, national fast food chains including Carl’s Jr. and Taco Bell announced plant-based menu options across the country. With more than 1,900 locations in all 50 states, Applebee’s is the largest U.S. restaurant chain that doesn’t offer a plant-based entrée at all its locations. Yet, its competitors such as Chili’s, Red Robin, and TGI Fridays have plant-based options on their menus. “Animal agriculture is the number one driver of mass extinction and is the number two contributor to greenhouse gas emissions globally. Which is why we’re calling on Applebee’s to join its competitors and offer plant-based entrées to make a difference for the health of its customers and for the health of the planet,” OMD’s Campaign Manager, Ashley Schaeffer Yildiz said. This latest action is intended to remind the chain that increasing access to plant-based foods should be a company priority–– as a meaningful gesture of good corporate citizenship as we face the urgency of climate change and to respond to customers seeking healthier options. OMD and the Center for Biological Diversity launched the campaign in September of last year with a petition encouraging Applebee’s to prioritize adding a plant-based entrée at all its locations with the support of thousands of signers. 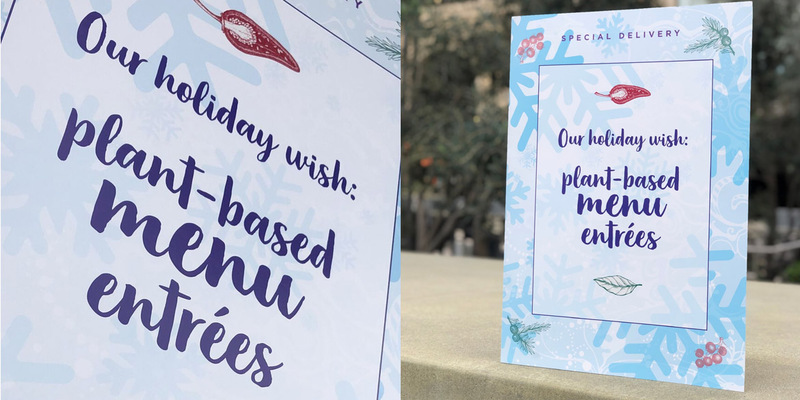 Then last December, OMD delivered a holiday card to Applebee’s CEO, Steve Joyce, at the restaurant’s corporate headquarters in Glendale, California. Thousands of signers asked Joyce to create lasting change for the holidays by offering plant-based entrée options. For more information on the campaign and to participate in the National Call-In Day, visit the Center’s website. The Center for Biological Diversity is a national, nonprofit conservation organization with more than 1.6 million members and online activists dedicated to the protection of endangered species and wild places. For more info, visit: biologicaldiversity.org.